Spine tingling, full stereo, unmitigated synthesizer power. The Studio Electronics CODE 8v OD with Both 5089 and SEM Filters is the ultimate vintage synthesizer. The two voiced synthesizer from Studio Electronics is capable of an entire songs worth of musical processing from its hardware. 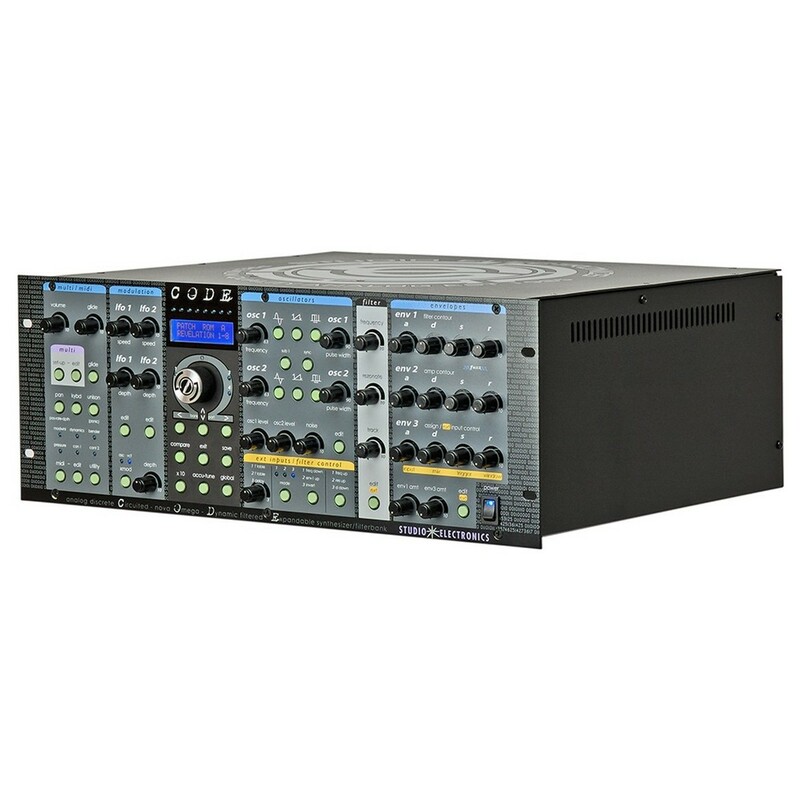 With more modulation than you'll need, an easy to use interface and powerful multitimbrality. The CODE 8 is an incredible tool for genuine synthesizer enthusiasts and musicians. Amazing for emulating that warm, fuzzy vintage style. With incredible VCO circuitry, best-in-class voice architecture, the Code 8 will undoubtedly be the ultimate central synthesis unit in your studio. 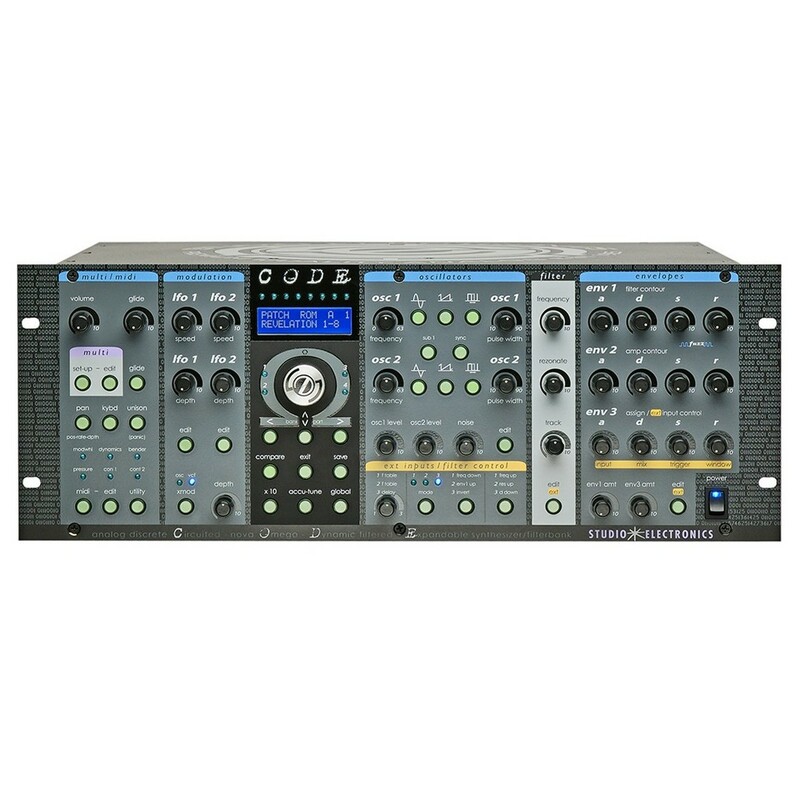 The Code 8 features two powerful voltage-controlled oscillators. Triangle, Sawtooth and Square waves are all available for you to craft that vintage sound. Oscillator 1 includes a sub waveform for you add depth to the voicing. Oscillator 1 and Oscillator 2's frequencies are able to be sync'd together. There are 8 sinewave generators on Oscillator 1 meaning there is high quality of voicing for your synthesized sounds. The Code 8v features a great user interface with knobs for controlling the frequency, pulse width, oscillator level and noise mix on your oscillators. Control the master tuning and fine tuning to give the Code 8 a distinct, vintage, slightly dissonant sound, great for recreating the old school sounds of classic synthesizer units like the CS-80. 8 real stereo panning synthesizers give you serious power. Each triggers it's own external input allowing for multitimbral layering and splitting with up to 8 separate parts. 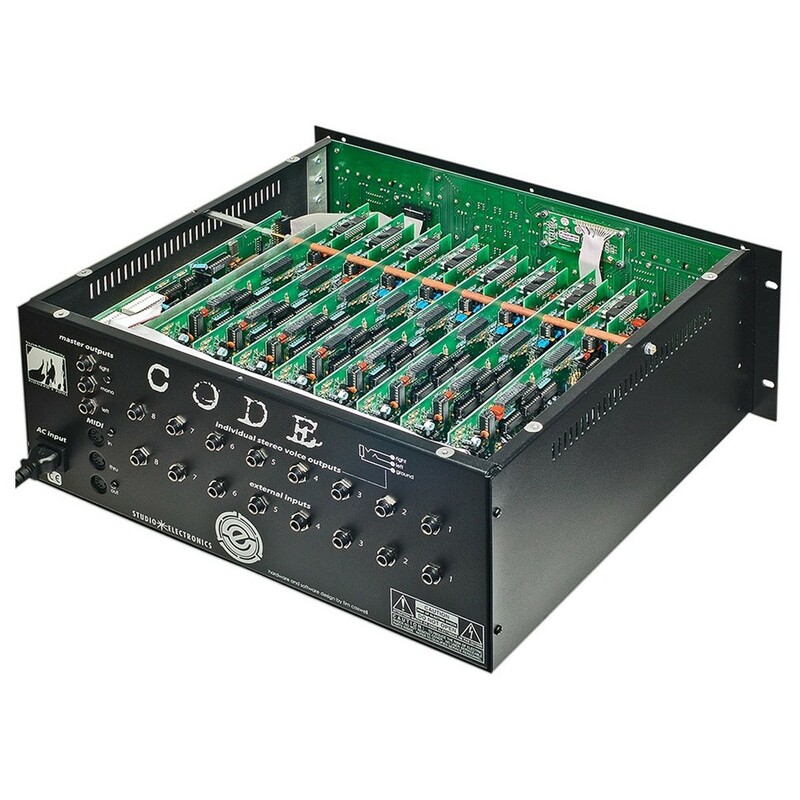 Up to 30+ simultaneous modulations and numerous controller assignments means that the Studio Electronics CODE 8v can handle anything you throw at it. A genuine synthesizer powerhouse. Modulate the VCOs with two low frequency oscillators to add movement to your synthesizer sounds. From slight phases to dramatic wobbles, add significant motion to both oscillator 1 and 2. All the controls you would expect are able to be pushed to their limits. Add filter resonance to boost overtones. Add noise to give it more analog grit, and change the depth to give the filter more movement on the oscillator. Each LFO is able to modulate up to three different destinations across the Studio Electronics CODE v8 which means you can utilise this powerful tool to make your synthesizer sound stand out in the studio and on recordings. Program your own patches and add them to the preset bank which includes over 500 factory presets. Using the easy to read onboard screen, save your favourite sounds with ease so they are ready to be called up at a moments notice. 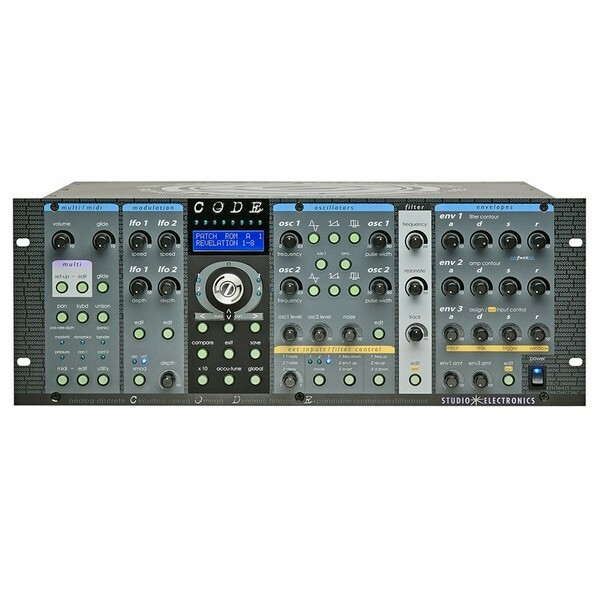 The Code 8 is fully programmable and ready to go, it's a powerful friend to have in your studio. 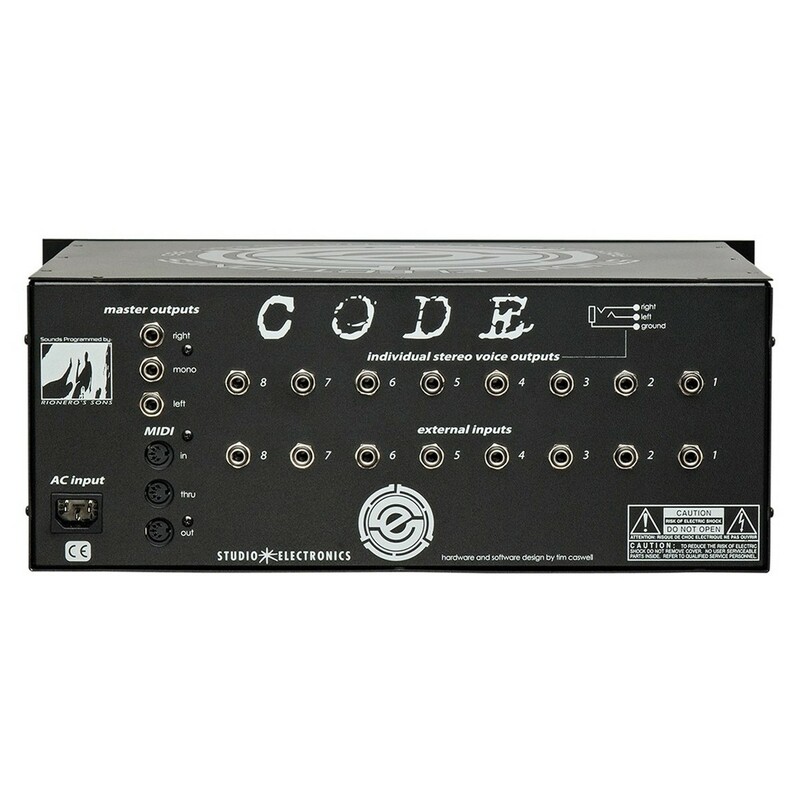 The Studio Electronics CODE 8v has great support for your MIDI controller. Just plug it in and off you go. Use your MIDI controller to compose amazing synthesizer pieces like you would on any other synthesizer. The MIDI capabilities of the CODE 8v feature everything you'll need. Modwheel and bender are supported as standard meaning there is a real performative control over the Studio Electronics CODE 8v's parameters. Control the envelopes, the LFOs and any of the other CODE 8v features with any MIDI controller. Voices: Mono, 2, 4, or 8. Multitimbrality: 2 voice = 2 part, 4 voices = 4 part, 8 voices = 8 part; parameters: patch, number of voices, mono or poly: splits, layers, prepared. Overdrive / OD (Optional): Eight: One per voice. Distortion setting fixed.